President Maithripala Sirisena presenting an award to a graduand. Picture by Sudath Silva. President Maithripala Sirisena said the government will provide all facilities to equip the Sri Lankan security forces with knowledge as well as expertise when implementing the state policy on national security. He made these remarks at the graduation ceremony of Sapugaskanda Defence Services Command and Staff College (DSCSC), Course No. 11, on Wednesday. The Commandant of the College Major General Ruwan Kulatunga warmly welcomed the President on his arrival at the College premises. Addressing the graduation ceremony, the President further stated that when fulfilling responsibilities of national security in a peaceful country as well as fulfilling responsibilities of regional security with the assistance of the international community, our security forces should be equipped with the technical knowledge and wisdom. The President also appreciated the humanitarian service rendered by the security forces in addition to their national security responsibilities during national disaster situations, and also valued the excellent support given to the fight against the smuggling of drugs and other illegal activities. 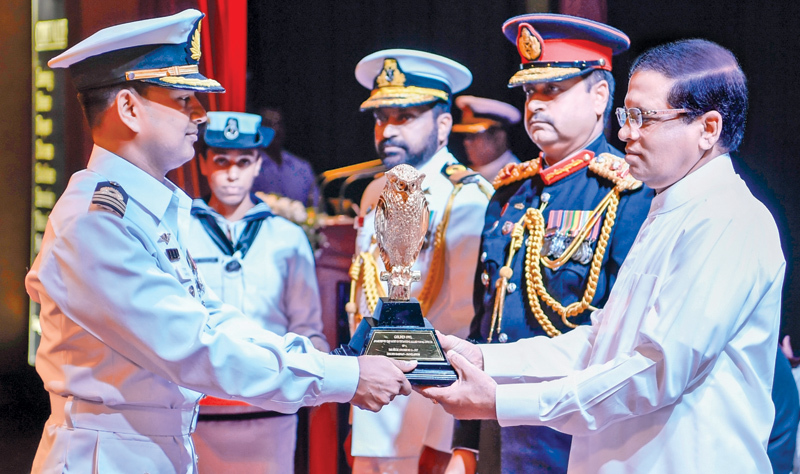 President Sirisena awarded degrees to several officers and presented awards for the local and foreign officers for their outstanding performances. State Minister Ruwan Wijewardene, Secretary to the Ministry of Defence Kapila Waidyaratne, the Chief of Defence Staff, Commanders of the Tri Forces, the Inspector General of Police, Heads of Security Forces and others participated.